Felix Leiter (Norman Burton) – Bond’s old CIA buddy is back for the first time since “Thunderball” and, considering he was last played by handsome would-be action star Rik Van Nutter, the years have not been kind. The eternally shape-shifting spy is now a somewhat lumpy, cynically middle-aged foil somewhat along the same lines as Cec Linder in “Goldfinger.” This time, however, Leiter plays a relatively active role between not terribly fumy wisecracks, helping Bond get where he needs to go and grudgingly pulling strings to save the lovely behind of Tiffany Case. Q (Desmond Llewellyn) – Q’s toys play a very active role in “Diamonds are Forever,” but we don’t get the usual scene where the old techie gives Bond a bunch of deadly new toys for his next big adventure. Instead, he appears to show-off handy doodads from time to time, like when he explains the fake fingerprint Bond uses to fool Tiffany Case into believing he’s diamond smuggler Peter Franks. Later, he gets a bit chummy with Ms. Case at the slot machines as he is seen openly defrauding the Whyte House’s with one of his gadgets. M (Bernard Lee) – After allowing Bond to engage in a very personal – though never discussed – vendetta in which he appears to use his license to kill to assassinate Blofeld, M is eager to get Bond back on track with an actual assignment. In a continuation of the multi-film running gag in which Bond persistently one-ups M on his knowledge of everything from cognac to lepidoptery, M is delighted to find out that Bond knows next to nothing about diamonds – but his satisfaction is short-lived. We love the old sourpuss. Ernst Stavro Blofeld (Charles Gray) – Though “Diamonds are Forever” is not actually the last film in which Bond faces his ultimate archenemy, it is the last film fully devoted to the to-the-death struggle between the two men. 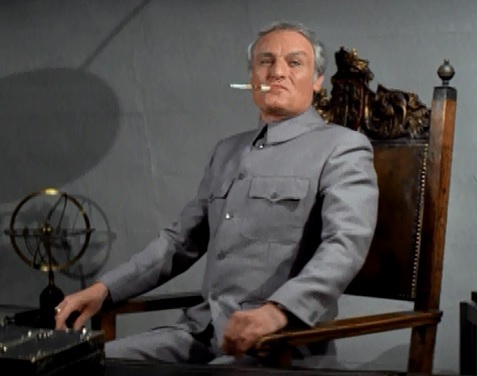 As portrayed by Charles Gray, grey-maned SPECTRE chief Blofeld is a bit more cheerful in his evil, and a lot hairier, than he was in past incarnations by the cue-ball headed pair of Telly Savalas and Donald Pleasance. Bert Saxby (Bruce Cabot) – Willard Whyte’s slippery right-hand man doesn’t get a lot of screen time and doesn’t really make that much of an impression before being posthumously sacked by his boss. He’s nevertheless very much worth mentioning, if only for the man who played him. If you’re a fan of classic era Amercan pop cinema, you’ll know Bruce Cabot as the original Jack Driscoll from the 1933 version of “King Kong,” and from innumerable westerns. A reliable performer, he never got the chance to be a true top banana, though he tested for the part in 1939’s “Stagecoach” that transformed his friend and frequent costar, John Wayne, into an American icon. 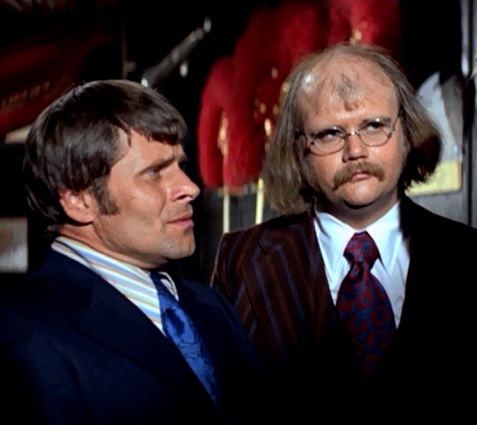 Mr. Wint and Mr. Kidd (Bruce Glover and Putter Smith) – If you can ignore the rather obvious homophobia in the portrayal of this pair of life-partners/ruthless assassins., Wint and Kidd are perhaps the two most interesting aspects of Diamonds are Forever. Faultlessly polite to each other, they may have little regard for human life other than their own, but there’s something kind of lovable and sweet about the pair. They remind us slightly of those overly-polite gophers from the Warner Brothers cartoons. The humor and chemistry between the two actors is more impressive when you realize that one of them wasn’t an actor at all. Walrus-mustached Putter Smith is a top-drawer musician, a bass player whose resume reads like a who’s-who’s of mid-century American jazz and pop. Smith was spotted backing up iconoclastic piano legend Thelonius Monk at an L.A. nightclub by director Guy Hamilton one evening, and the rest was history. While he didn’t exactly embrace his fling with film fame, Smith remains active to this day and teaches at something called the Bass Institute of Technology. Peter Franks (Joe Robinson) – This lowlife diamond smuggler has the chutzpah to object when Bond steals his identity. The result is not so healthy for Franks, but he puts up quite a fight. Actor, stunt man, and martial artist Joe Robinson was Sean Connery’s judo instructor and had already starred in a couple of cut-rate Euro-action films, including one as a Tarzan knock-off hastily renamed “Thor” to avoid a lawsuit. Robinson hit the headlines in the UK in 1998 when the 70 year-old retiree successfully fought off eight muggers. Assorted mobsters, mortuary folk, and a shady comic. A few colorful types involved in diamond smuggling show up, mostly to threaten Bond and the women who dig him. They reason they stick in the memory more than some other characters is that they are also played by, well, some pretty colorful types. – Leonard Barr, who portrays aged mobster-comedian Shady Tree, was very much the humorously low-rent comic and show-biz lifer he appeared to be. He was also Dean Martin’s uncle. – Marc Lawrence’s murderous hood gets one of the film’s most infamous lines, as he expresses surprise that there was a pool for Plenty O’Toole to fall into after he’s thrown her out of a window. An old friend of writer Richard Maibum, the respected and very busy character actor is also noted as one of the sadder victims of the House Un-American Activities Committee. Nevertheless, if you really want to see Bond cold-bloodedly off a bunch of disarmed bad guys, this is your movie — and it starts in the opening sequence. We’ll also assume the plastic surgeon we see laying outside the lair a bit earlier was merely subdued by Bond with a knockout blow or some drugs, and not actually killed. However, Bond later disarms another very dangerous thug with a help from a strategically placed mousetrap, and then disables him with the help of a thrown dart — but then he keeps throwing darts until the crook is good and darted to death. That might be an iffy call between self-defense and manslaughter. On the other hand, it’s pretty obviously semi-state-sanctioned murder when he straps a suddenly defenseless Blofeld to a gurney and propels him into a convenient pool of super-hot molten mud. “Welcome to hell, Blofeld!” Bond exclaims. In fact, the man is one of a number of seemingly suicidal, plastic surgically-created Ernst Stravro Fauxfelds we meet throughout the film. Moving on, diamond smuggler Peter Franks is bad news, for sure, but he’s no Blofeld. Yet, in the heat of battle at least, Bond has no problem blinding the man with a fire extinguisher (which in theory could kill him right there) and then using it to knock him over a a railing and to his perhaps not so instant death…and it’s not like Bond gets on to phone to summon an ambulance for the guy. Oh, and then he and Tiffany Case use Franks’ disused digestive system to smuggle diamonds. As for those particularly noxious yet lovable psychopaths, Mr. Kidd and Mr. Wint, Wint dies horribly but, mostly in self-defense, when Bond uses a conveniently placed bottle of Cognac to turn Wint into a not-so-appetizing fireball. Kidd, on the other hand, is pretty much murdered for fun when, completely disabled, he blows up real good after Bond places a ticking explosive meant for himself near some pretty Freudian portions of the killer’s anatomy and throws him off an ocean liner just as he explodes. That’s what we call dead. For all we know, there may be one or more other killings that wouldn’t pass legal or ethical muster, but they fly by pretty fast. It’s worth noting that the still-controversial instant action/crime classic, “Dirty Harry,” would be released exactly one week after “Diamonds are Forever.” The public was rapidly growing ever more tolerant of the idea of representatives of the state “cutting a few corners” in the pursuit of their idea of justice.